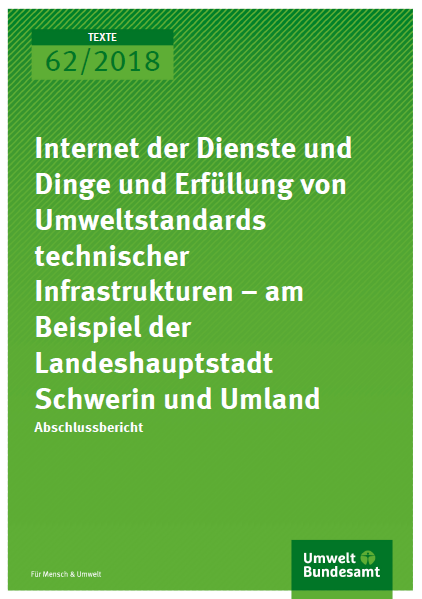 This final report presents the results of the research project "Internet of services and things and compliance with environmental standards of technical infrastructures – a concept study for Schwerin and its surroundings". The report is available for download. Chapter 1 introduces the problem and the procedure and presents the project region Schwerin and its surroundings considered in this study. Chapter 2 shows which central developments in the project region form the framework conditions for the study and what effects these have on various infrastructure areas in the project region. On the basis of this description, it is also briefly explained what contribution the selected case studies, that form the basis for the concepts, make to the solution in the respective infrastructure areas against this background. The concepts for a possible implementation of solution and improvement options in the respective infrastructure areas are presented in Chapter 3. The results on solution and improvement options that were presented in the concepts are subsequently presented in Chapter 4 as part of an overall concept. It demonstrates which potentials and in particular which synergies with other infrastructure areas arise for the urban-rural region of Schwerin as well as comparable regions if the options presented in the concepts are further considered in the sense of a "Smart Region Schwerin". Chapter 5 finally gives recommendations for action on the basis of the concepts drawn up, each of which is addressed to the federal, state and local governments. Buhl, Oliver et. al. 2018: Internet der Dienste und Dinge und Erfüllung von Umweltstandards technischer Infrastrukturen – am Beispiel der Landeshauptstadt Schwerin und Umland. Umweltbundesamt: Dessau-Roßlau.